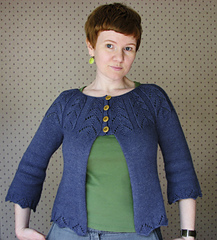 An’aafil boanny’ cardigan with flattering lines and an easy Shetland lace featured at the yoke, hem and cuffs. ‘Moch’ means moth and ‘aafil boanny’ very beautiful in Shetland dialect. 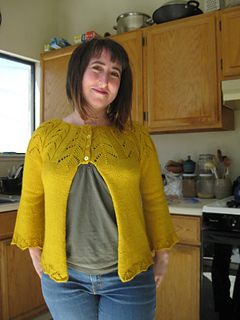 This cardigan is worked seamlessly from the bottom up starting with the hem. Sleeves are worked in the rnd separately and then joined to the body at the yoke. 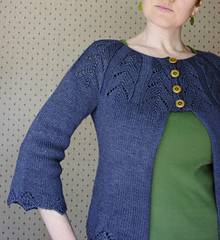 The buttonband is worked at the same time as the yoke. Underarm sts are grafted together at the end. Table format where you fill in the appropriate numbers for your size. Notes on sizing and modifications. Written and charted instructions for the lace yoke. Detailed instructions on how to work a One Row Buttonhole. As there are 10 sizes in total in this pattern I chose to write the pattern using a table format. I believe this will allow for easier reading of the pattern and avoid long brackets packed with numbers. When you begin the pattern you will fill in the appropriate numbers from the table for your size. Spaces have been provided next to each bold letter in the pattern for your convenience. I was prompted to implement this after reading a timely discussion about it on Ysolda’s blog. Thanks Ysolda! 850(950, 1000, 1075, 1150, 1250, 1300, 1380, 1460, 1530) yrds of DK weight yarn. 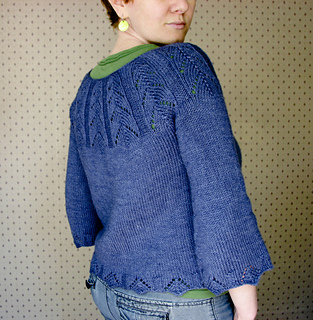 Shown in Jaggerspun Zephyr-Silk (50% Merino wool/ 50% Tussah Silk), DK weight, 1120 yrds per cone. 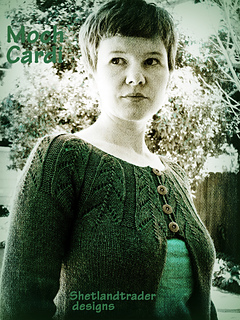 This yarn can be ordered by the cone and also by 140yrd balls from sarahsyarns.com. This is not the laceweight version of this yarn. US#6 (or size needed to obtain correct gauge) 32-inch or longer circular needle. US#6 set of DPN’s or two US#6 circular needles if you prefer working with two circulars for knitting in the rnd. A spare circular needle or set of dpns (US#6 or smaller), stitch holder or waste yarn (for sleeve sts to sit on while working second sleeve). 4 buttons of 3/4 inch diameter and matching thread. Wool/silk blends or Alpaca/silk blends in a similar weight and with good stitch definition and drape. Shown in size 35 inch with 1.5 inches of negative ease.